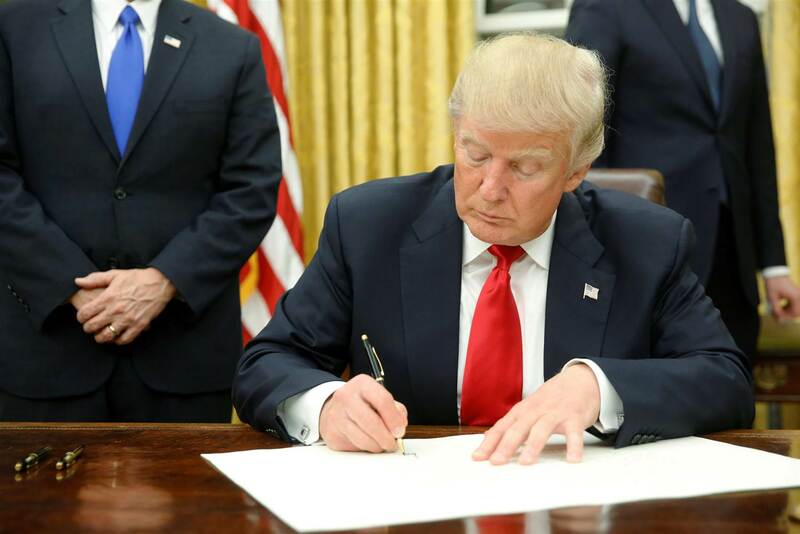 On October 12, 2017 President Trump signed an executive order that will dismantle the Affordable Care Act, also known as Obamacare. This order is meant to lower costs of and bring more healthcare options to millions of people. Trump called this new executive order the beginning of ridding America of Obamacare. Congress failed to “repeal and replace” Obamacare, but Trump was relentless and took action. This was one of his campaign promises that he intended to keep. This change is said to cost the United States government virtually nothing but will also allow the American people to have better choices in regards to their healthcare. This order will fulfill one of his campaign promises; allow health insurance companies to operate across states lines. Trump believes that an interstate competition between companies will result in lower premiums for both small businesses and consumers that buy their own health insurance. The executive order requests that the Labor Secretary ease restrictions on short-term health plans and allow consumers to buy the expanded use of short-term policies from three months to a year. Consumers will also be able to renew short-term health plans. Federal agencies will focus on the US on hospitals, doctors and other provider’s alliance that may be the reason costs are rising in insurance markets. After this, they will have to come up with a plan that will offer lower premiums with limited benefits outside the requirements of the Affordable Care Act. The Treasury Department must find ways to expand the use of Health Reimbursement Arrangements, which are tax-free accounts. These accounts allow employers to give their workers money for expenses regarding coverage. This will allow small businesses to group together to purchase association health plans. Each state has specific regulations which can make it more expensive for insurance companies to operate in different states. Because of this, the five biggest health insurance companies—UnitedHealth Group, Anthem, Aetna, Humana, and Cigna) service half the insured population. Trump believes that the increased competition will drive insurance costs down. But instead, critics worry the executive order could increase these five companies’ monopoly and end up raising costs. The reason the Affordable Care Act was formed was to produce a large risk pool for those who do not get coverage from work or government plans. The people who are healthy in the pool counterbalance the costs of the sick. Critics worry that the order will allow insurers to deter from Obamacare regulations, allowing them to sell plans with lower monthly premiums and limited benefits. This will drive away younger and healthier consumers from Obamacare, and destabilize the insurance market forcing insurers to make health coverage more expensive for sick people. In the past, association health plans were a way to bypass state insurance regulations. They may not follow the rules of the ACA that require plans to cover a basic set of benefits, therefore producing limited benefits. With this being a possibility, the less packaged health plans might appeal to healthier consumers who decide that they do not need coverage for things such as prescription drugs and other amenities that they likely will not use. If these association plans that offer limited benefits rise in popularity, it may leave a lot of Americans with poor coverage. President Trump and Republicans have promised for a long time to try and cut premiums for the millions of middle-class people, including self-employed business people and early retirees, who do not receive subsidies and must take the hit of cost increases. A senior administration official said the changes could take six months or longer to take effect, maybe not even until 2019. Experts say the executive order probably will not have an impact on premiums for 2018, which is expected to be higher in many states for people buying their own policies.